Does this ever happen to you? 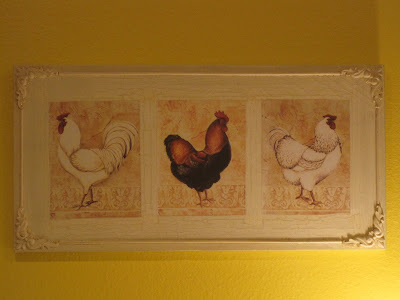 I found these cute rooster wall hangings at a garage sale over Labor Day weekend...I was just going to buy the one below (to be frugal) but she told me to take the other one as well, which I was happy to do! Total cost: just two dollars! its such a handsome frame and it looks nice on your wall, jenni. oh it's always fun to have new stuff so let the others enjoy your old ones as you did when you had them, ok? nice to see you back. I've thrown things away that I couldn't ever imagine coming back into fasion only to discover that a few months later they are the in thing! I love the rooster pictures. Oh, I soooo know what you mean. I can't believe you got those great roosters for just $2.00!!!! 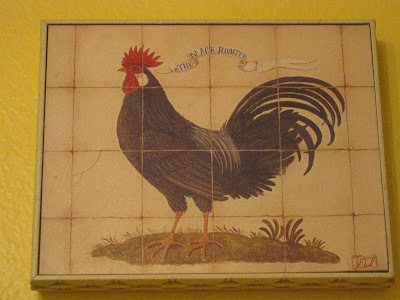 I have been on a big rooster kick since the rooster party where everyone showed their roosters. 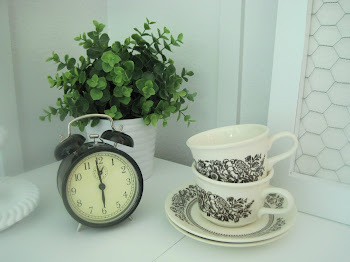 I now have an inspiration picture from an old Country Home or Living magazine that shows a French Country Rooster themed kitchen that I am in LOVE with. Hmmmm, we will see. 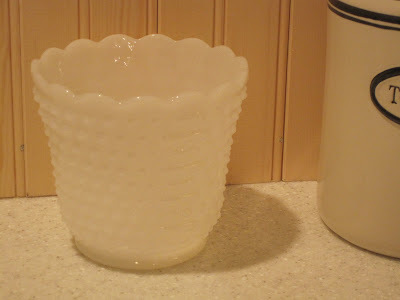 i LOVE milk glass!!! what a great find! What cute pictures, I especially like the second one with the three roosters. How are you? I love the roosters - too cute! How are your other projects coming along? I hope things are going well for you and your family! Those are all three treasures! My love of roosters has came and gone many times. I'm in love with them right now too!! Love yours!! So sweet of you to drop by my blog! I really appreciated your comments! (I'm the girl with the purple bathroom.) Love how you're fixing up your home. It looks great so far, and I can't wait to see more projects- the bead board in particular, I love. I am planning on putting some up all over my house soon...just gotta find the time and funds! Thanks again for stopping by! I can so relate to that! I think I might want to go a different route in my decorating, but always seem to come back to my red, toile, and roosters. I love both those pieces you bought and what a great deal! have a great weekend! Amy... I so understand busy! I've been real bad about getting around to everyones blog too. If it wasn't one thing it was another! But here I am to say "HI!" I collect roosters (I just started up again myself) My daughter bought me the cutest wooden rooster for my birthday.. I will have to do a post on my roosters! I love all the buys you found! It looks like you found some neat things. I use to collect different things but my tastes have changed. I think that's pretty normal. "Could we with ink, the ocean fill, and were the skies of parchment made. Were every stalk on earth a quill, and every man a scribe by trade...To write the love of God above would drain the oceans dry. Nor could the scroll contain the whole, though stretched from sky to sky!" Once upon a time, a young couple went to look at a house for sale. "It's been unloved, that's obvious, but we can fix that," she said, planning to fix everything right away. "I can't see anything here that can't be fixed," He agreed, thinking of all the money they would save by fixing things themselves, and planning to take one project at a time. And so the couple bought their first house, each greatly underestimating the work that lay ahead... For the girl, from a long lineage of die-hard Fix-Its, and the boy, a descendant of the Most Frugals had met their match...for turning this house into a home would be no easy feat. God, Do You Hear This Southern Girl Rambling?